T Shirt printing in Singapore or putting on a custom t shirt is surely something that all Singaporeans have experienced before. T shirts are the most commonly used apparel in terms of custom and personalised printing. They are used for CCAs in schools, corporate events, exclusive campaigns and even as uniforms. T shirts in Singapore have become the staple choice of apparel for many reasons, mainly due to its humid weather. The affordable cost makes it perfect for giveaways and ideal for teamwear, which is proving to be a trend nowadays. All in all, the use of t shirts is becoming a much more common sight in our sunny island. The idea of ordering custom printed t-shirt is one that is still overlooked by some people these days. This is largely due to the fact they do not wish to go through the hassle of printing a t-shirt. From designing the artwork or logo, finding the correct placement on a shirt; To deciding on which printing method works best, this may all seem like too much work for a solitary mind. They would rather opt to go with existing t-shirt designs in the current market or even not print at all. You may not realise it now, but a simple printed t-shirt will do wonders for you. Without further ado, let us tell you why. There are endless possibilities when it comes to custom printing your very own personalized t-shirt. Printing your own design onto a t shirt gives you the creative freedom to come up with something that has not been done before. Choosing from the different printing methods can also determine the outlook for your design. Certain print methods can make the colours of your design stand out more. You have full control of how you want to make your t shirt unique. More T Shirts Are Saved! Ready-made t shirts often get chucked away after several weeks of wearing them. They are insignificant and only serve aesthetic purposes. Once a design gets old, interest is lost and those t shirts never get worn again. Custom printed t shirts serves a more meaningful purpose, they can represent your CCA club in school or represent your company. These custom t shirts are being worn with dignity and you do not have to keep buying them over again. Thus, saving cost and reduce wastage of t shirts. They are also a cheaper alternative for corporate gifts compared to electronic items. T shirts are timeless. Electronic items like power banks may become obsolete in the near future as technology advances. A Unique Way Of Marketing! Gone are the days when marketing was purely slotting in brochures in letterboxes or buying advertising spaces off newspapers. Today, marketing can be done by literally any means. T shirts might be your best marketing strategy. Put on a custom printed t shirt with your company logo and you immediately have a walking advertisement. Now imagine your entire company putting on the same t shirt. Marketing has never been made simpler. Forget about paying additional marketing costs for services with little to no results. At TREA, we provide high quality printing for different t shirt designs in small or bulk quantity with attractive prices. With over 600 satisfied clients, we have proven ourselves to become one of the most reliable custom t-shirts supplier in Singapore. This project features two different print methods on two different dri fit t shirt selection models. The royal blue 100% microfiber eyelet design dri fit t shirt features an embroidery of the company logo. Our client, Rolls Royce, approached Trea to custom print on dri fit t shirts for their team building event. The embroidery method works perfectly with the Rolls Royce brand logo. Embroidery logos are not commonly done on round neck dri fit t shirts, hence making the t shirt an exclusive one on its own. The light blue heather blend dri fit t shirt was custom printed with silk screen printing. This unique tshirt material with minimalistic printing create a well combination of t shirt printing in Singapore. Both t shirts had the name of the event printed behind. The finished product was one that left our client very satisfied. View our wide selection of custom dri fit t shirts that are guaranteed to be of high quality for your team building event or outdoor sports activities! 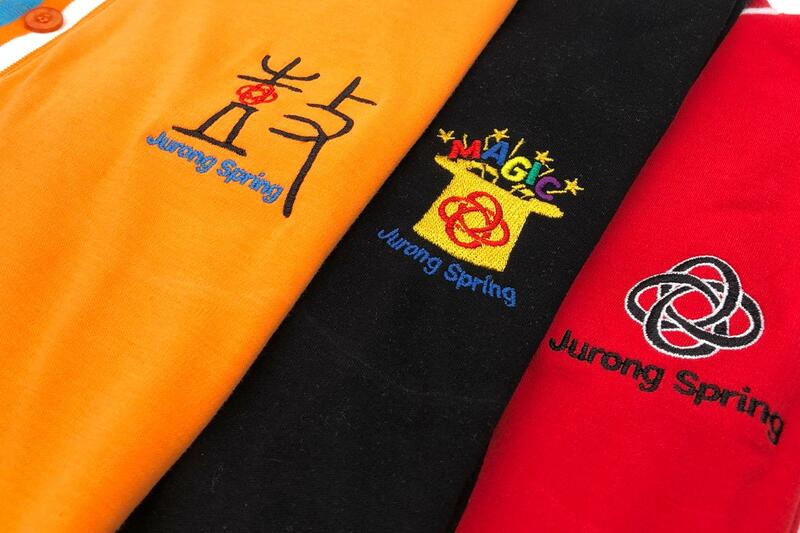 TREA was approached by Jurong Spring Community Club to custom print on cotton polo t shirt. Embroidery logo of the community club and its two interest groups were done on the polo t shirts. These polo t shirts were chosen specifically to match the colours of their specific logos. The color of the t shirts make the embroidered logo stand out, making them unique on its own. Embroidery on polo t shirts is one of the most lasting printing methods and creates a look of professionalism. Our selection of custom polo t shirts will leave you spoilt for choice with color combinations and unique designs that you can use for your company’s uniform. Speak to us today! 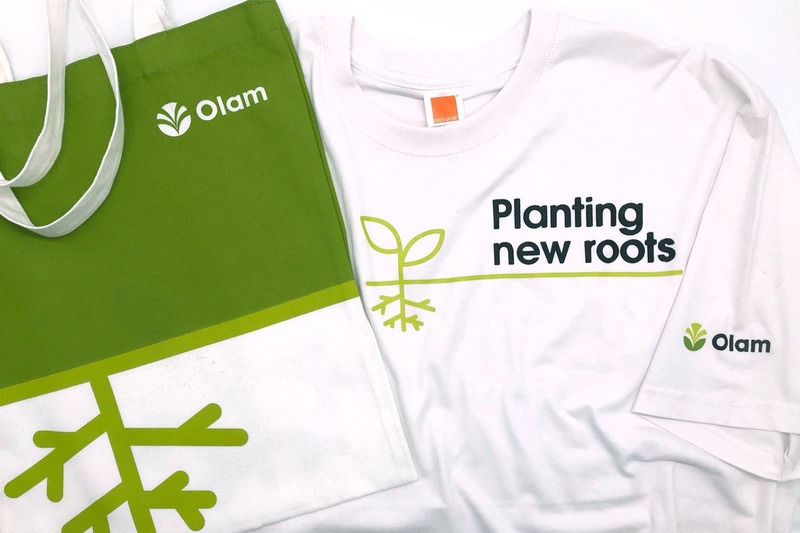 TREA was being approached by DIA Brand Consultants to custom merchandises for Olam’s new Singapore headquarters opening. Our client requested for two different products. They are custom cotton t shirt and a customised canvas tote bag. The t shirt featured silkscreen printing of the company’s logo on the front and sleeve. Three brand colours consisting of black, light green and dark green were printed accurately to their pantone colors against the white cotton t shirt. Olam’s customised tote bag features a full surface silkscreen printing. This printing method was ideal for our client who wants their custom canvas bag to be in their corporate Pantone code color. As only silkscreen printing is able to achieve pantone color, therefore we proposed for this print method to be done. Otherwise in general circumstances, we would recommend to custom the bag with ready dyed colored canvas instead. Our custom cotton t shirt selection gives you the option to choose amongst the best colors to represent your company. Intrigued by our full surface silkscreen printing capabilities? Our customised canvas tote bag promises many other surprises such as add on accessories and extra compartments! In looking for custom corporate merchandises for their staff, TREA was approached by Solace Systems Singapore to custom print on PVC L shape folder and cotton t shirts. The L shape folder was custom printed with one color printing and a customised card holder in the front. Their corporate t shirt for staff featured silkscreen printing of the company’s logo across the chest section. Solace System’s minimalistic logo design stood out well when printed on white or black t shirts. Our selection of custom cotton round neck t shirts are suitable for both minimalistic logo designs as well as artwork designs! Should you need any personalised corporate merchandises, our stationery selection is guaranteed to provide you with what you need. 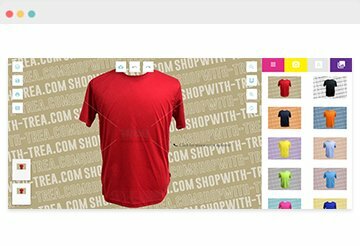 Why Print Your T Shirt With TREA? With more than 5 years of experience in this industry, TREA has always maintained its goal in providing premium quality products to our clients without overpricing them. It is in our practice to ensure that even our premium products are reasonably priced. Our t shirt catalog boasts a wide range of t shirt variety from different brands. This will save you the trouble of going into multiple websites just trying to find the most suitable t-shirt. We accept low MOQs for tshirt printing in small quantities. We also provide the option to customise t shirts from scratch with a MOQ of 100 pc. Should you have doubts on the quality of our t shirts, we do provide sample delivery for your viewing. Being service oriented is one of the many traits that resonate highly amongst the staff at TREA. We take pride in discussing on how best to print your design onto our t shirts and clarify any concerns. In the entire t shirt printing process, we will be with you to decide on the tshirts that is most suitable. Whether it is to cater to your event or employees, or as a corporate gifts for your clients in Singapore. A customer’s feedback is the truest gauge of how well or badly a company is doing. Throughout the years, TREA has garnered top and truthful reviews from satisfied clients in Singapore. Our team has worked hard to go far and beyond to achieve the gold standard for printing high quality t shirts. Here are the links to read up more Google reviews left by our customers.